The line came off the downrigger clip as Les Fernandes of Fish On Charters and I trolled in the morning light at Lake Berryessa. He shouted for me to grab the light trolling rod. I pulled it out of the rod holder and carefully reeled the feisty fish in. The fish made a few more runs before he netted it and put it into the boat. It was a beautiful, silvery rainbow measuring 15 inches long that looked like a half pounder steelhead. It had perfectly formed tail and fins and was absolutely clean, with none of the copepod (lernia) parasites that have plagued the fish in some years. The fish hit a Shasta Tackle Wiggle Hoochie behind a Sling Blade at 30 feet deep off Steele Park. We didn’t hook any other fish, so Les decided to pull up the lines and move to the area off the Big Island. 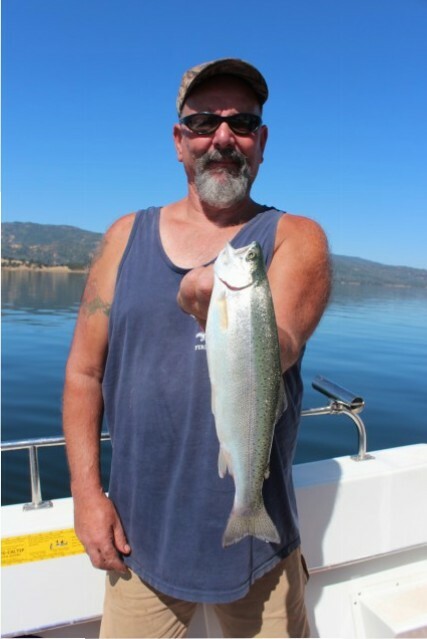 Les Fernandez of Fish On Charters holds up a pretty rainbow caught while trolling at Berryessa. We caught three more fish and lost one while using Wiggle Hoochies and Micro Hoochies at 30 feet deep. After the trout stopped biting, we pulled our lines in. As I was bringing in the rod on the starboard side of the stern, I felt some weight. “I think I have a fish on here,” I told Fernandes. But when I got the fish closer to the boat, I realized it was a fat crappie, not a trout. Les netted the 14-inch crappie and I put it in the ice chest. On the other rod, Les brought in another crappie about 13-`1/2 inches long. I was stoked because I love crappie – and this was the first crappie that I had hooked at Berryessa in nearly 20 years. Amazingly, both fish hit in open water, away from any major structure, over 115 feet of water. We ended the day trolling in Markley Cove, but didn’t hook anything there. The fishing wasn’t hot by any means, but all of the fish were robust and healthy. It was great to see both beautiful rainbow trout and crappie back in numbers at Lake Berryessa, now that the lake is full from the winter and spring storms. When I first fished at Lake Berryessa in September of 1986, Claude Davis of Esparto wrote fishing report for Markley Cove Resort. He reported at the time that anglers were catching limits of rainbow trout while trolling in the cove and near the dam. I decided to call him up and prod him for a little more information and maybe go fishing with him. “Heck, I’m not fishing for trout now. Trout taste like garbage. I’m crappie fishing off the docks everyday. My friend Buster Hertzberg and I just caught a bunch of them today,” he replaied. He invited me up to fish off the docks a couple of days later and I had one of most fun days fishing of my life. Claude showed me where to fish on the docks and how to work the jigs for maximum success. We caught one crappie after another. 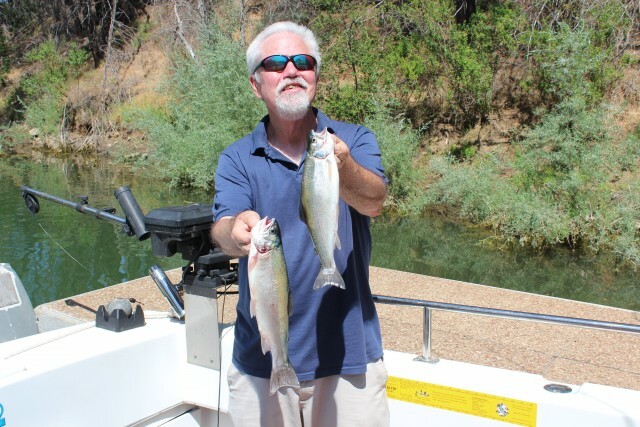 Dan Bacher, Fish Sniffer Editor, landed these two rainbows and two others, along with two bonus crappie, on a trip to Berryessa with Les Fernandes of Fish On Charters. The fish ranged from small ones up to 14 inches. I caught over 100, myself, keeping 50 crappie ranging from ¾ to 1-1/2 pounds on red/white mini-jigs. I fished for crappie with Claude many times after that. Although he preferred to catch crappie more than any other fish, he ironically become most known well known for catching trout on downriggers until he passed away over 15 years ago. I only went trout fishing with him twice, but we landed limits both times. Unfortunately, the crappie fishing declined after 1991, although it shows signs of revival this year with the high water conditions. At that time, rainbows were the only salmonid found in the lake, other than an occasional wild brown. The fishery was managed by the DFG as a “put and grow” one, but the fish rarely went over 2 pounds. Starting in the late 1990s, the California Department of Fish and Wildlife introduced kokanee salmon and then king salmon to the lake, providing a trophy fishery for kokanee, kings and rainbows. In the past few years, anglers have noticed a sharp decline in the salmon and trout fishery. Some anglers have pushed for an increase in fish plants, but in an article published this March in the Fish Sniffer, Gary Coe, President, President of of Kokanee Power, and Gary Erck, President, of CIFFI, cautioned against this, based on the data from the CDFW. Lake Berryesssa, shown here at Markley Cove Resort, hosts rainbow trout, king salmon, kokanee salmon, smallmouth, spotted and largemouth bass, channel catfish, black crappie and bluegill for anglers to purse. “A study over the past 18 months has been conducted on Lake Berryessa, in the hopes of identifying why the kokanee fishery has declined there. By using water quality samples from late 2015 and through 2016, the DFW has discovered that the dissolved oxygen content of Lake Berryessa is lower than needed for a thriving kokanee fishery. During the sample period, dissolved oxygen was measured at a level of 2; a level of 5 is needed for kokanee to thrive,” they wrote. “The watershed that fills Berryessa is mostly rain and very little if any runoff comes from snow – thus, the water entering the lake is warmer than other lakes that receive their water from snowmelt (think Pardee, Melones, Pedro),” they said. “ Speculation is when Berryessa’s capacity level drops somewhere below 60% capacity, the hypolimnium of the lake is very small and that results in very low dissolved oxygen levels – causing the kokanee to die off. 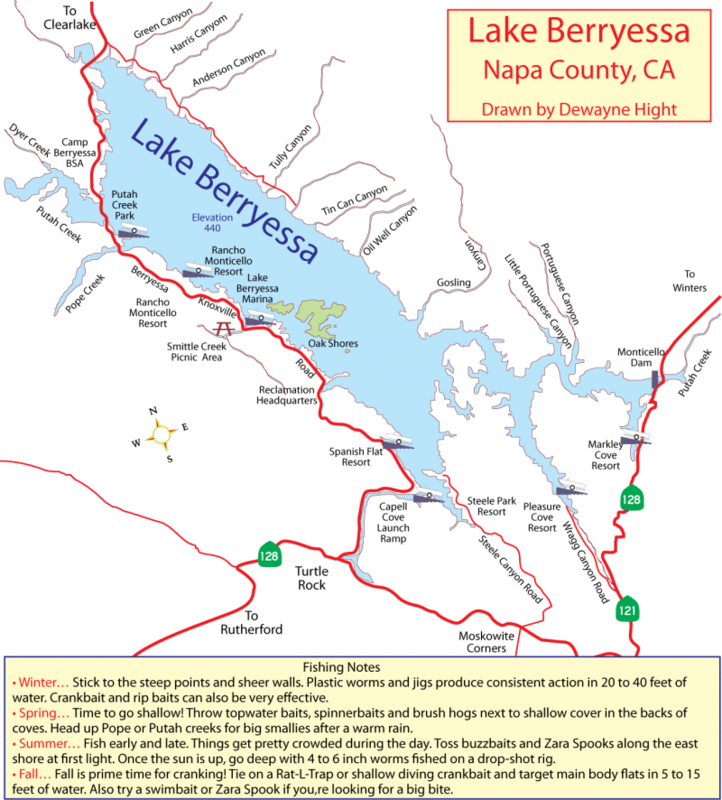 When Berryessa fills, the hypolimnium layer is thicker and greater dissolved oxygen is available,” they noted. The CDFW concluded that such a die off didn’t happen earlier because the latest drought was first extended one we have experienced since kokanee and kings were planted in Lake Berryessa. 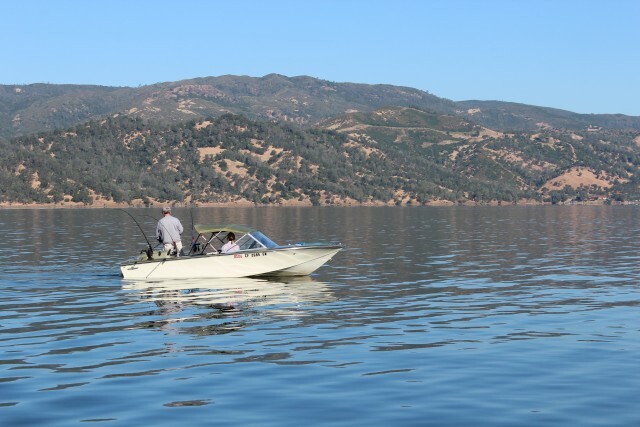 Trolling for trout and salmon is popular year round on Lake Berryessa. The CDFW has planted around 50,000 kokanee fingerlings in the lake most years. They stocked 49,995 in 2013, 49,994 in 2014, 25,001 in 2015, and 50,111 in 2016. King salmon plants have varied widely by year. The CDFW planted Berryessa with 178,380 king salmon in 2013, 88,910 in 2014, 32,440 in 2015 and zero in 2016. It is not known whether any salmon will be planted in the lake this year, due to the lack of available fish from either Iron Gate Fish Hatchery or Feather River Fish Hatchery. The current trout fishery is a result of spring trout plants by CDFW, as well as trout from the CIFFI/Markley trout pen-rearing project. While king salmon, rainbow trout and kokanee salmon are taken year round at Berryessa, trollers find the best action during the spring and summer when a distinct thermocline forms. Anglers catch the kokanee on hoochies, spinners, bugs, and spoons, tipped with white corn, behind dodgers and the kokanee on rolled shad and many of the same lures as the kokanee. When the turn over takes place in the fall, shore anglers fishing minnows and nightcrawlers under bobbers regularly hook rainbow trout in Markley Cove and other area of the lake. 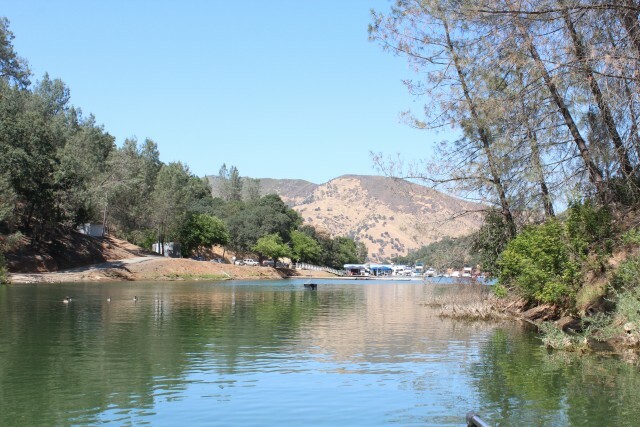 Besides trout, salmon and crappie, the lake also hosts robust populations of smallmouth, spotted, largemouth bass, bluegill and channel catfish that draw many anglers to Berryessa every year.